What if you got a problem areawith increased ground moisture? Spoiling the foundation, poor harvest, constant puddles and kilos of mud on shoes - all this, undoubtedly spoil the mood of any landowner. The first solution that comes to mind: to sell territory. But what if you already love their possessions and would not exchange it is a cozy place to another? Then do not be lazy, do the drainage area with your hands and continue to enjoy their favorite neighborhoods. The vagaries of nature in the form of frequent rains, singlepuddle in the garden, seasonal dirt in the garden - this is still no reason to sound the alarm and to spend money on a drainage project. We need to clearly distinguish between when the earth needs help, and in some cases, the soil itself to cope with the natural force majeure. Watch your possessions, draw conclusions and get to the site drainage, land drainage only when the following problems. soil swelling - an extreme step overabundancehumidity when you need to take action immediately, otherwise the expanding soil will destroy not only the paths, but also lead to the appearance of cracks in the foundation, walls, skewed windows and doors, up to the transformation of your home in ruins. It's important to know! 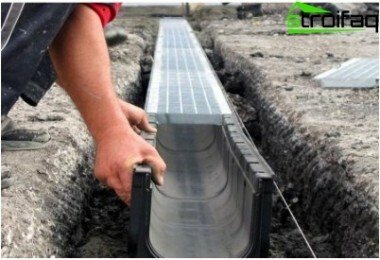 Design and site drainage device - an essential measure for those who own territory with a clay soil, in the lowlands, areas with abundant groundwater, rivers, valleys, regularly flooded by heavy rains or melting snow areas on reclaimed swamp area. Drainage - a combined system of pipes and ditches,placed on a piece of land or around the perimeter, including structures on the site. The main objective of such actions - to protect buildings from moisture, soil moisture normalize by diversion of excess water beyond possessions. 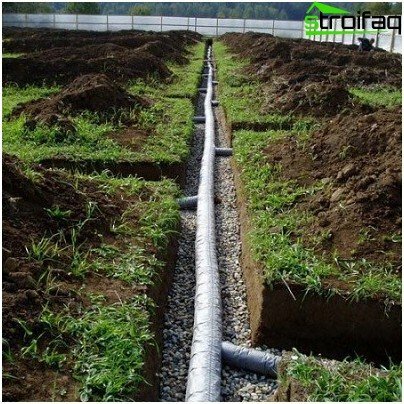 You can order from the site drainage projectspecialized company or else build a system draining soil with their own hands. As often happens, and in this case all depends on your ability to finance, time and desire. Before you learn how to do the drainage on the site, you should decide which of its kinds to choose, because the right choice and the correct order of work - is the basis for success of any operation. Surface when done on the territory of drainage for excess water, which appeared as a result of frequent rains and / or abundant snowmelt. 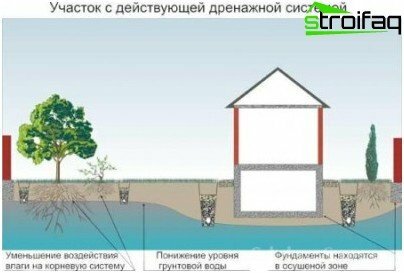 Deep, which is relevant in the case of near-surface location of groundwater to protect the buildings from destruction, and a vegetable garden, yard and garden from flooding. 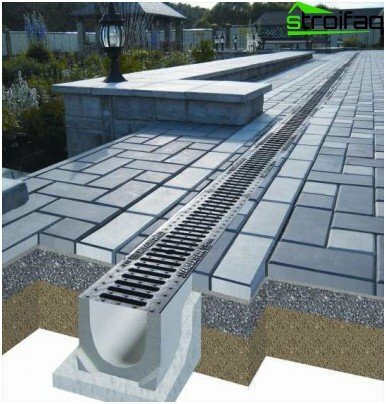 Linear drainage system is often superficialall is a series of trays, arranged with a special slant to the place of total moisture collection. Containers are installed in the trench with a layer of gravel on the bottom. This suburban area drainage effective if the soil slope exceeds 3 degrees relative to the horizon. Roughly speaking, when your possessions are lower than neighboring areas. 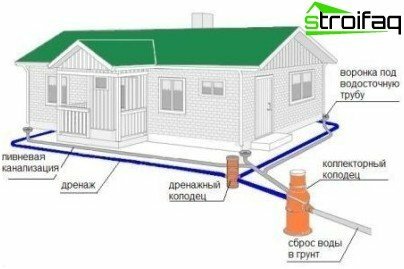 Spot drainage system - a collection ofdrain pipes with water inlet. 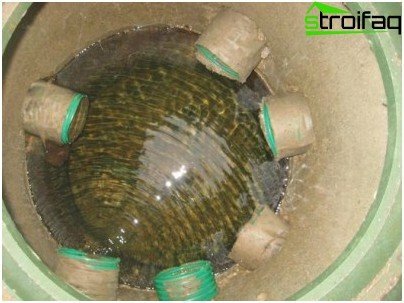 This device resembles a well-separated siphon wall - bars, which is necessary to clean the water coming from the waste to the system is not clogged, and no unpleasant smell appeared. Some landowners are fitted with a receiver unit a special basket for garbage collection. It's important to know! Not enough for each part of one of the drainage systems, sometimes to maintain proper humidity is necessary to combine them. 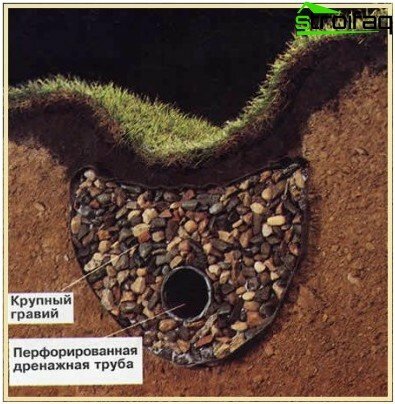 As already mentioned, the superficial systemdrainage - a solution for areas suffering from heavy precipitation (rain, snow). Implement such a project "to life" is much easier than to build a deep drainage. Even the beginner summer resident under the force of such a range of activities. The main thing - a sound approach, and the exact order of operations. Where to begin? Inspect the area, make a tentative scheme tranches placement. As a rule, around the perimeter of the main run ditches and water accumulation locations and additional trench made. Recommended by experts channel width - 50 cm depth - 70 cm, slant walls - about 30 degrees. Auxiliary depressions dug out with a bias to the main trenches, and the latter - with a bias towards the collection tank. How to make a surface drainage system atTrays help? In accordance with the above recommendations excavated ditch is filled with a layer (10 cm) of sand to be compacted. Top should be placed selected trays and cover them with sand catchers and waste. 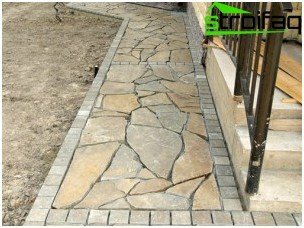 In order not to spoil the landscape and prevent the ingress of large debris in the system, it is recommended to close the trench grates. It is worth paying attention! Which trays to choose everything for surface drainage? You are free in their decision of this question. You can buy plastic or concrete do (and can be supplemented with polymers) capacity. Meanwhile, some landowners and costwithout trays. Then deepening 2/3 of the largest backfilled with gravel. This is followed by a layer of fine gravel, and on top - the turf. To improve the drainage system so you can wrap the rubble geotextile. area of ​​flower beds, lawns, flower beds - 60-80 cm. Recommended professionals width of grooves - 40 cm. It's important to know! 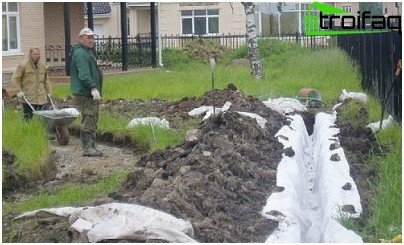 If the soil on your possessions peat, experts advise to do the trench not less than 1 meter deep, such as the ground settles quickly. 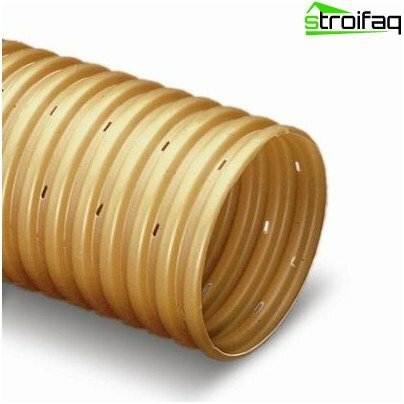 To create a deep drainage systemuse a special tube with a network of holes with a diameter of 0.15-0.5 cm. Do not use a stray from the Soviet era asbestos cement or ceramic pipes, because these materials have proven ill "in" (require frequent washing due to fast clogging). Today, such operations exist perforated plastic pipes, some of them are even equipped with a filtering membrane, which prevents clogging design. In the dug trench is filled and compacted layer of sand (10 cm). Trenches dimmed geotextile so that the web edges are above the recess. 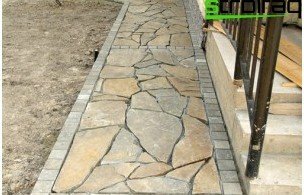 This is followed by a layer (20 cm) of crushed stone. On top lay a pipe. The design is filled with gravel up to half the height of the ditch. 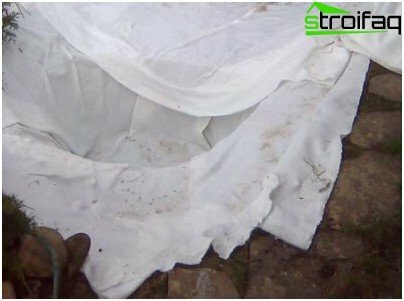 Next, fold the geotextile, which will transmit water, but keep the soil particles and debris. The remaining half is filled depressions loam and fertile soil. The complex of works is completed the creation of wells located in the lowest points of the site from which water can be displayed in the storm drains, gully or the nearest body of water. Deep drainage is good that virtually unnoticed. The fact that it is in the territory, only you know. But I have to work hard to create such a system. Making the drainage area, you can help protect buildings, garden and garden from the negative effects of moisture and turn the land into a problem a favorite vacation spot.